These rules are disclosed to clarify the various responsibilities of all community members here on Herpy.nu :: The Home of Dragon Art. They shall be adhered to by everyone to ensure that our board runs smoothly and provides a fun and productive experience for all of our community members and visitors. Greetings and welcome to Herpy, the Reptile Lovers Community and fanbase for everything scaley! Now also 100% Varka-free! 1.1 Herpy is a community for those who share a metaphysical, sentimental or general affinity with scaly creatures such as dragons, gryphons, nagas and other reptilians. We like to share art, discuss topics that interest us and have fun together. Everyone is entitled to their own opinion, and even if we don’t agree we are respectful to each other. If you feel this is the right community for you, we welcome you with open arms. If you don’t share our interests, please move on and let us be. 2.1 To register on Herpy and be part of our community you must be of at least 15 years or older, as per European standard for viewing explicit content. 2.2 If you do not comply with our purpose as stated above in 1.1, do not create a account here. 2.3 It is strictly forbidden to have more than 1 account active on this site. Creating duplicate accounts is a ban-able offence. 2.4 For the sake of the personal integrity of all of us, you are not allowed to have explicit pictures as avatar. 2.5 Please keep your signature small, preferably not taller than 250 px at most. We recommend no more than 150. 2.6 When you have registered your account and activated it (the activation email required may take a few minutes to arrive, also make sure to check your junkmail) please make a thread in the "Introduce yourself" section. That helps you get started in the community and socialize with its members. In your introduction post, drop a few lines of who you are and why you are here (and perhaps also where you come from). Until you have made 5 proper posts your account may be restricted due to security reasons, do not take this as a excuse to shitpost or spam. 3.1 The forums are a discussion board, therefore we promote well-written and thought out posts. Short replies carrying little to no meaning or point are generally frowned upon. If you feel for idle chit-chat, we kindly refer to our Discord chatroom. 3.2 Please use proper grammar and spelling in your posts so that they dont become a eyesore. Posts like containing a lot of shorthand (such as "u" instead of "you") or lacking punctuation are frowned upon. There are plenty of spell-check programmes out there, use them. Repeated offences of this kind might lead to a ban. 3.3 Do not make double-posts or more. Please use the "Edit post" and "Multi-quote" functions instead. 3.4 It is forbidden to insult, demean or in any way attack another user. 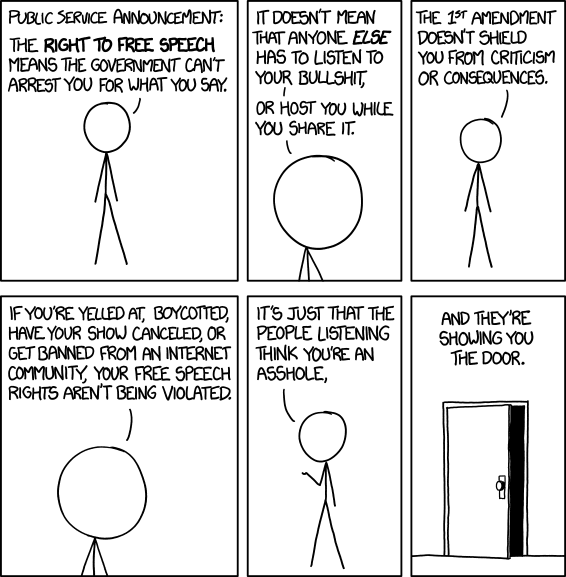 3.5 Free speech does not shield you from the consequences or questions about what you posted. However we are always respectful to eachother even if we do not agree, and we do not demean eachothers beliefs or similar. 3.6 Your personal experiences matter nothing compared to actual facts. 3.7 Dont state your personal beliefs as if they were global truths. They are beliefs for a reason. Neither are you allowed to claim what someone else or isnt. 3.8 Anyone is free to start a new discussion thread at any time, but before you do so please check at least a few pages back so that you dont create a duplicate thread to one already existing. Also please make sure to post it under the right category. If you are unsure of where to place it, ask a member of staff. 3.9 When creating new threads or posts which contain explicit content (especially pictures), please mark the title with "(NSFW)". Same goes for links. 3.10 When you reply and others have replied before you, it's a good idea to quote who you are directing your reply to, so that misunderstandings can be avoided. 3.11 Cross-posting, as in posting the same post in several threads / categories is forbidden. 3.12 The regular forum is not a platform for you to share your personal life and events therefrom. Such things fit better into our Blog section which is dedicated to that purpose. 3.13 Do not hi-jack or derail threads. If you feel you'd like to discuss something that goes off-topic, create a new thread better suited for your purpose. 3.14 This forum features a wide selection of ways to alter and format your text. Please note that this is for highlighting certain parts of the text or made headlines. Regular forum text should be just regular forum text. Typing entire posts or text blocks in specially formatted text (such as glow, different color, etc) is forbidden. 4.1 Even though the blogs generally follow the same rules as the rest of the forum in regards of grammar and respect, they are a tad bit more loose on the topic of discussion. The blog is your personal space in this community and its where you are supposed to share what you are up to and whats going on in your life. This is where you can talk about stuff that does not belong in a discussion thread on the regular forum. 4.2 This community is not your personal and free-of-charge shrink. If you have nothing to say except constant rants where you feel sorry for yourself its better to be quiet. We are here to enjoy our time together and have fun, we do not want to read about how you are going to kill yourself. If you are in a really bad situation, talk to someone that can actually help, such as a professional or at the very least a good friend or family member. 5.1 We on Herpy are very open-minded, but there are limits to our tolerance. We do not agree with or condone any situation where another living creature except yourself gets hurt. 5.2 If we see you post something that could lead to potential harm for you or someone else, we will interfer. 5.3 It is forbidden to share private messages with the public unless you have the approval of the other affected users as well. Likewise it is forbidden to share screenshots or similar information from the chatrooms, parts of the forum not open to guests or other more private instances without the direct approval of all those involved and members of staff. 5.4 Posts making clear statements against equality and human rights (such as "all gays deserve to be killed") are frowned upon and will likely get you kicked out of here for disrespect. 6.1 This site is kept in order by its Moderators and Administrators. They have been handpicked for their personal qualities and we trust them to do their job well. You must never ignore a member of staff when they tell you something for the better of the community. 6.2 You are always able to discuss a matter with a member of staff but remember that in the end, their word is law and if they place their foot down, you are to comply. 6.3 Generally, you are given 1-3 warnings before a ban strikes. Likewise, you usually get 1-3 temporary bans before a permanent one. 6.4 Creating a new account to attempt ban evasion is forbidden. 6.5 If you feel you have been mistreated or unjustly punished, you can always contact another member of staff via the contact page to open a dialogue. 1. How do I join the chatroom? 1.1 First of all, you need to register a account on Discord. Its free from charge and obligations. 1.2 When you have your account ready, send a PM to Valcyrie requesting to join the chatroom. She will respond with a link that when clicked ads the chatroom to your server list on Discord. Please note that the link is personal and only lasts for 24 hours due to security reasons, so if you miss getting it in time you have to inquire for a new one. 2.1 The chatroom follows the same rules as the forums for respect and no insults etc, the only real difference being no requirement of post quality or going off-topic. The chatroom is meant as a hangout where you can chat idly or just derp about. Talk about whatever you like, whenever you like. 2.2 Just like the blogs, the chatroom is not a place to seek attention with suicide threats or forever rant about how terrible your life is. Do that out of the public eye, thank you. 2.3 A ban on the forum leads to a ban on Discord as well, and vice versa. 2.4 The chatrooms are made for members of this community only. Friends or other people who are not active members are not welcome here and should under no circumstances be invited. If you should see something like that happen, please report to a member of staff ASAP. 2.5 Do not spam messages or images or write in constant caps. Likewise, dont use the tag (@username/everyone) unecessarily. 3.1 Discord is a free-of-charge blend of Teamspeak and Skype. Its simple, stable and ad-free. It also comes with a bunch of neat-o features that Skype lacks. It also has way lower memory usage, lags less and have always active voice channels that you can join at the click of a button, no calls with hosts needed. Friend list and connection to several servers make staying in contact with your friends easy and fast. In case you dont want another program, you can just as well run Discord directly in your browser. You can read more about it on their website. 4.1 This is the main chat of Herpy where you can talk about almost anything at anytime. 4.3 Massive image sharing is not okay. We prefer no more than 3 images in a row, otherwise it becomes hell to scroll through, especially for mobile users. 5.1 This is a chat dedicated to role-play of the non-explicit kind. Regular smalltalk does not belong in here. 5.2 Image / link sharing is to be avoided if they dont have a direct association with the RP. 6.1 This is a chat dedicated to sexual and explicit role-play. Regular small talk does not belong in here. 6.2 Image / link sharing is to be avoided if they dont have a direct association with the RP. 7.1 This chat is read-only. Only members of staff have access to post here. Important messages about the community are shared here so that the news reaches as many as possible. 8.1 This is like the Members Chatroom channel. A idle non-specific talk channel but for voice communication. Sit back, talk about nothing and everything or listen to Raven making his chicken pizza.